I used to dream about living in a lighthouse. I imagined the sound of the surf crashing against rocks as I stood alone, looking out at sea with the blinking light above me guiding ships to shore. I’m not sure where this fantasy came from. I grew up in the Midwest and didn’t even see an actual lighthouse until I was in my twenties. Still, I imagined it as a very romantic sort of life. There’s something so alluring about lighthouses, don’t you think? The Tybee Island Lighthouse is probably the most accessible lighthouse I’ve seen so far, and it gave me a glimpse of what it might have been like to be a girl growing up at a lighthouse (not in a lighthouse, though, as I would have wanted). The lighthouse itself is open for tours. You can climb the 178 steps to the top, which is the only way you’ll see water from the lighthouse grounds. Seems odd, doesn’t it? Looking straight down. That small speck of a person near the red roof is my mom. 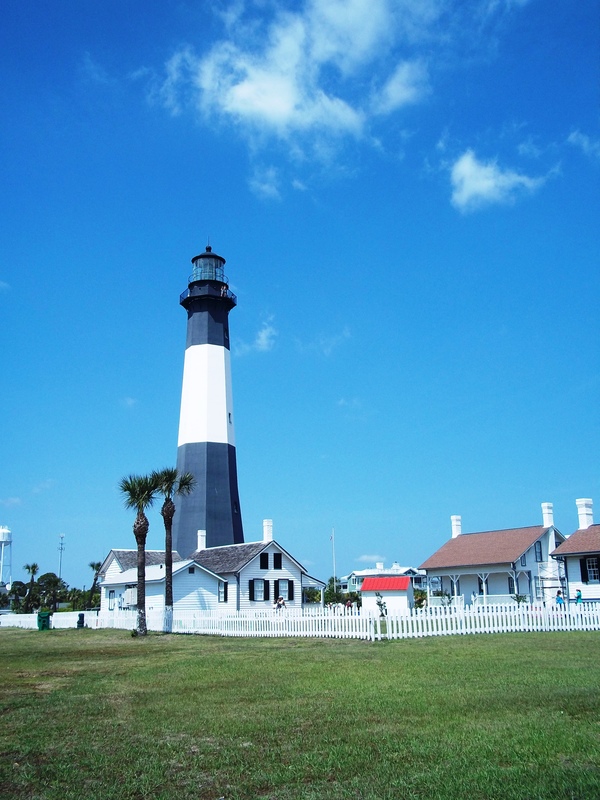 But the current Tybee Lighthouse is actually the 4th lighthouse to be erected on Tybee Island. The first Tybee Lighthouse was blown down in storms because it was built too close to the shore and the seawater rotted its foundation. The second lighthouse was not much further inland. Within two years of its completion, wind erosion had removed a good part of the sand under the foundations and the decision was made to build the third lighthouse away from shore. Then, during the Civil War, Confederate troops from Fort Pulaski set fire to that tower in order to prevent the Federal troops from using it to guide their ships into port. 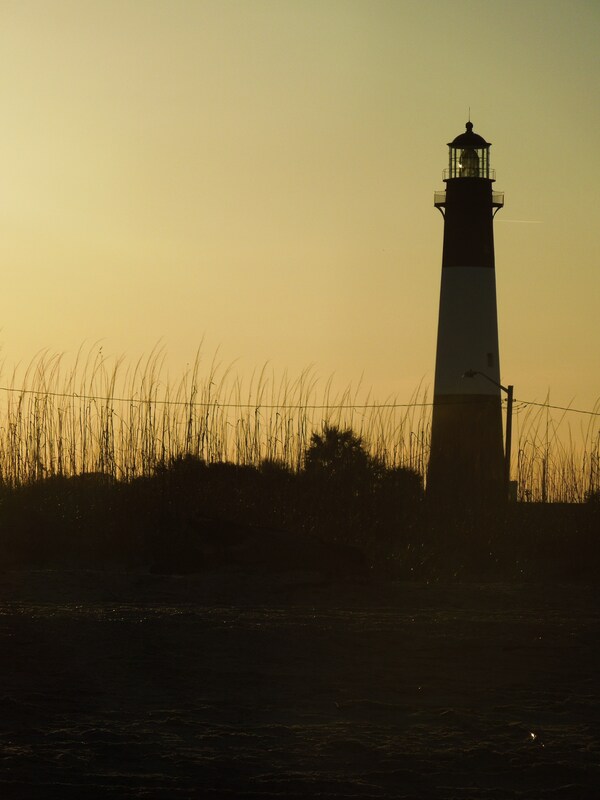 After the Civil War, the Lighthouse Establishment began work on rebuilding the Tybee Light. The lower sixty feet of the old lighthouse was still intact, and it was decided to add to the existing structure instead of starting from the ground up. The U.S. Coast Guard occupied the lighthouse until 1987 when the Tybee Island Historical Society took over in restoring the historical sight. 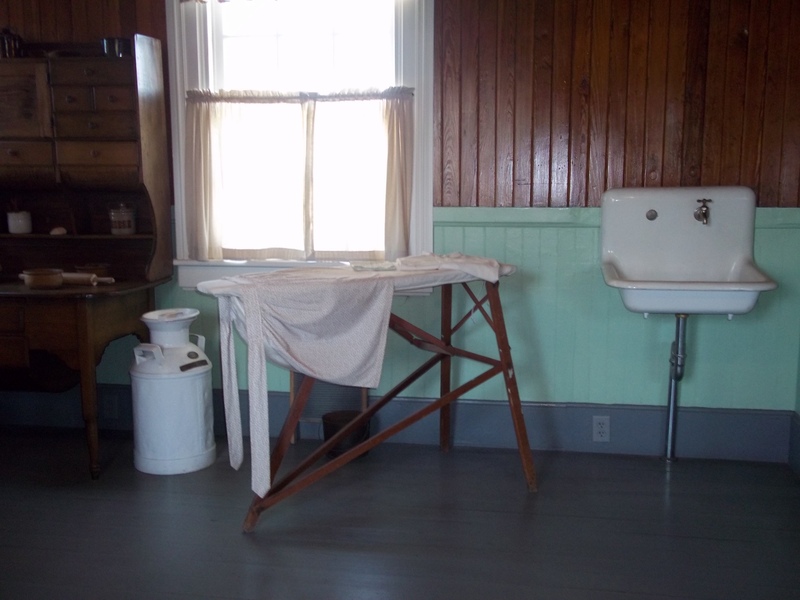 Now visitors can explore the lighthouse as well as the Lighthouse Keeper’s cottage as it might have looked in the early 1900’s. This would have been my room. 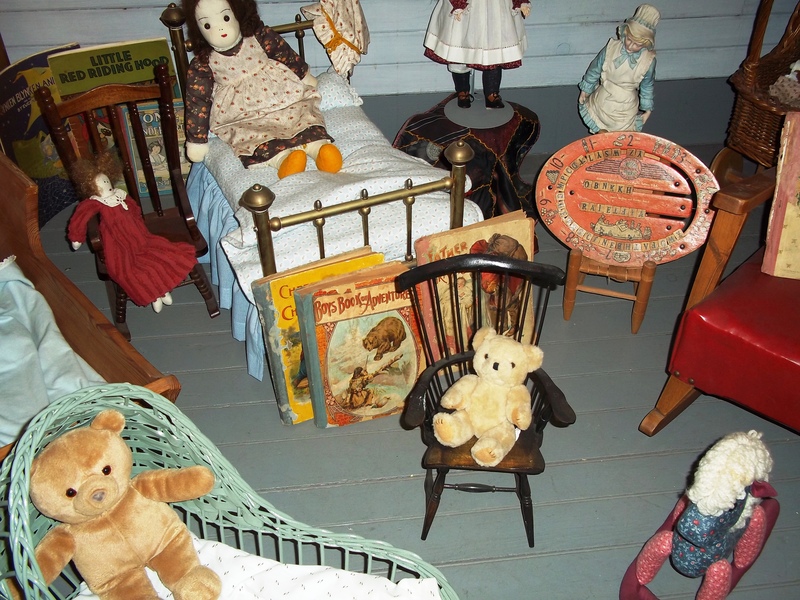 Old fashioned toys in the lighthouse attic. I was actually a little dismayed to think that if I’d grown up as a Lighthouse Keeper’s daughter I would have lived in a house next to the lighthouse; not in it. Now that I’m older (and perhaps wiser), I realize that the real beauty is in living somewhere close enough to view a lighthouse, not within its walls at all. How do you feel about lighthouses? Lighthouses are a fascination of mine also. I LOVED driving around New England, stopping at as many lighthouses as I could. Maine has some of the most beautiful. Ah, Maine. We stopped Pemaquid Point. I think it was the lighthouse of my dreams. I wanted to live in a lighthouse too. Oh, and I didn’t know that you actually had to live in the house next to the lighthouse. But I think your conclusion is right …. you want to have it’s view. And within it’s walls might be a bit claustrophobic. And all those stairs ! We’re much older and wiser now. Living next to a lighthouse surely beats living inside. Yes! That is a great idea. I think there are a few lighthouses that you can spend the night in, but they are few, and are very expensive. An entire lighthouse hotel seems like a moneymaking idea, for sure. 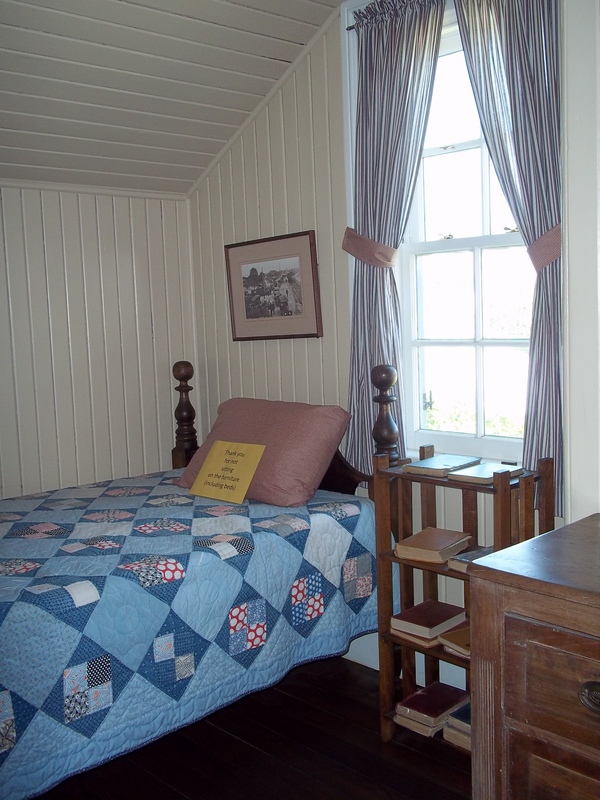 I’ve always been fascinated by lighthouses and my favorites were on Prince Edward Island – one of them had guest rooms! Oh my gosh! I need to add that to my list. I’d already been thinking about a trip to Prince Edward Island. This just took it up a notch. Thanks for letting me know! Thanks, Roy. The Coast Guard does still maintain the light in the lighthouse and it is lit at night. But I noticed it doesn’t have a blinking pattern like others I’ve seen. Still, the port of Savannah is very busy, so perhaps this lighthouse does still guide ships. I can’t believe you could have been a lighthouseman!!! Wow, what if your bedroom was way up there with the great view! It would get old climbing all those stairs, and you’d probably be happy to sleep next door! Great post! If I were at the top of the tower, I’d feel like Rapunzel — which is my favorite fairy tale. I’m starting to realize something about myself..
Lol, thinking about growing your hair real long? It always adds something when visiting these places to imagine yourself living that life. Inside the lighthouse does seem more romantic, though, even if less practical. Thank you. I love that picture, too. I turned around and the sky was turning orange and I was so happy I had my camera with me. You’d definitely be in good shape– like my daughter who practically ran all the way to the top. 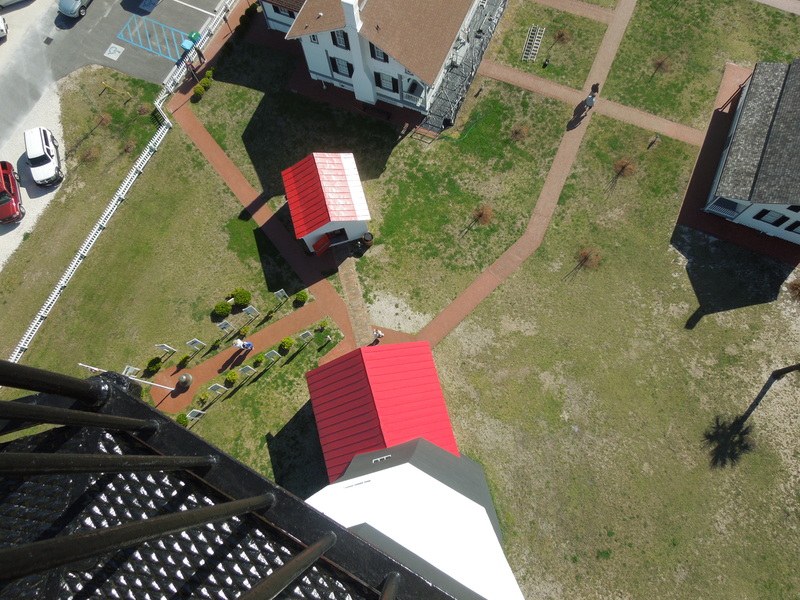 That photo from the top of the lighthouse looking down makes me dizzy but it’s great. I’ve always been fascinated by the idea of living in tight spaces, imagining how I would arrange the furniture, whether it’s a boat or a lighthouse or even a prison cell (I know, my mind is odd at times). I do, too! There’s something cozy about it. I think it’s safe to say we’re not claustrophobic. There are actually several you can visit along the eastern coast of the US. Most are still in use, just not manned like they used to be. I love lighthouses, what a bummer it was when I went on a tour of one as a kid and found out that you didn’t actually live in it 😦 I still think they are cool though. I wonder where we got this idea of living inside one? It must have been in a book or movie when we were younger. I love lighthouses too! Got to see Tybee Lighthouse last year. Was really neat. I like that Tybee has restored the outbuildings, too. It lets you see that there’s more to the lighthouse keepers life than just the light.